The Nonprofit President/CEO–How Much Board-CEO Trust Is Involved? The title, president/CEO for the operating head of a nonprofit, clearly signals to the public who has the final authority in all operating matters and can speak for the organization. * It is not an ambiguous set of titles. However, the terms “manager” or “executive director” can be quite ambiguous and do not generate the same external understanding or respect. 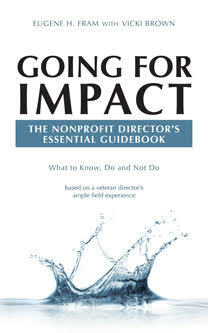 An executive director can be the administrator in a small church or the operational head of a large arts organization. The public and some corporate directors often view managers and executive directors (because of the organizational history of nonprofit) as “hired hands,” not as professionals who, with strategic vision, are able to manage all operational activities. The president/CEO designation calls for a trusting relationship with the board based on mutual respect, drawing from the symbolism that he or she is the operating link between board and staff. It is a new type of partnership culture. However, a solid partnership does not allow the board to vacate its fiduciary and overview obligations. The board has moral and legal obligations to “trust but verify” and to conduct a rigorous evaluation of outcomes and impacts of the CEO and organization annually. • Has authority to initiate short-term loans from a bank for emergency funding. The board has established a limit on the amount to be borrowed. • Sees himself/her as an equal partner in fundraising efforts. Knows how to effectively interact with top managers in stakeholder organizations. • Is comfortable is interfacing with senior executives of other NFP organizations, especially those to which the organization wishes to emulate. • Is confident about his/h management experiences and expertise, understanding that nobody does a job perfectly. Occasional modest management missteps are viewed by the board in proper perspective. • Has good professional relationships with board members. • Does not view the job as being in jeopardy. • Feels comfortable in disagreeing with board members. • Feels comfortable with the processes the board uses to have executive sessions without management present. • Feels comfortable with a rigorous examination of CEO performance. • View CEO as a peer who deserves respect, not seen as a board servant. • Do not discuss the CEO’s professional limitations outside of the boardroom. • View the CEO as an effective staff leader. • Look to the CEO to be have state-of-art knowledge and vision for the areas in which the mission has been defined. • Expect the CEO to grow professorially and tries to support that growth within the financial means of the organization. “In order for a trust-based governance system to work, companies must first develop a culture that discourages self-interest.”** In the nonprofit environment, many work to achieve a mission at the expense of self-interest. Consequently, a “high-trust” culture should be easier to establish at the senior levels. While the trust the board has in its chief operating officer can’t be described in exact quantitative terms, viewing it through the lens of a set of behaviors can give an idea of whether it is excellent, good or nonexistent. * Note Well: In many states a volunteers who carry the title of president /CEO can accrue personal liabilities not incumbent on other board members. ** David F. Larcker and Brian Tayan (2013) “Trust: The Unwritten Contract in Corporate Governance,” Stanford Closer Look Series July 31st. ← The Enron Debacle, 14 years Ago—2015 Lessons for Nonprofit Boards?